Memories of a deserted house? Of days infused with dreams? Severe palsy’s afflicted me, severe palsy it seems. Deep down inside me, the rains are falling far and wide. Translation of a Bengali poem by Shakti Chattopadhyay. The Bengali title of the poem was “jokhon brishti namlo”. 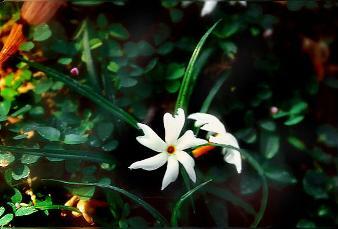 Shiuli is the name of a flower found commonly in Bengal. The flower is deeply rooted in Bengali culture. In particular, it is a flower that has found great favour with poets. I wonder what brought you to the site. I had merely sent you an email containing the translation. But nice of you to have guessed I was here. Thanks for the comments. Took me a while to reach this stage. I suppose I will revise more over time. I don’t know why IL didn’t accept the upload. We’ll be back in Philadelphia on the 12th. Have you read Camus’ First Man? It was his unfinished autobiographical novel. As a grown up man, he goes to visit his father’s grave. His father had died young under unenviable circumstances. As he stands in front of the gave, it occurs to him with a shock that the person inside the grave, though his father, was younger than him at the time of his death. As I told you once, I think, my father graduated from the University of Pennsylvania way back in 1935-36. I plan to visit theuniversity’s archives after we return to see if I can find the address where he lived. If successful, I will visit the area. I am sure it’s vastly changed, but something of him must still be there. At least in the air. The air of a man far younger than me. I am looking forward to the experience. Happens to be one fo my favorite poems from the collection. But then, I have always been obsessed about the poet, and all my friends know that!